Al Hartmann | The Salt Lake Tribune ìMeet the Mormonsî cast member Carolina Munoz Marin is a top women's amateur kickboxer in Costa Rica. She and her husband run a charity. 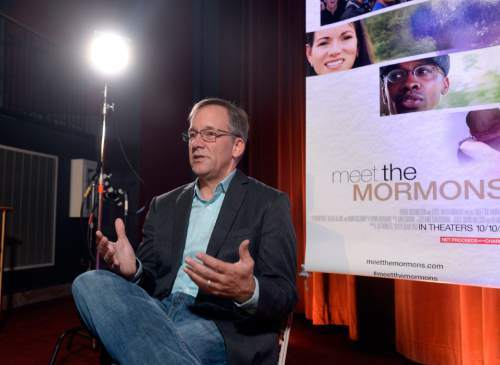 Al Hartmann | The Salt Lake Tribune "Meet the Mormons" writer and director Blair Treu. Blair Treu ï Writer and director of ìMeet the Mormonsî Al Hartmann | The Salt Lake Tribune "Meet the Mormons" cast member Jermaine Sullivan. He is an academic counselor and volunteers as a bishop of a dieverse Mormon congregation in Atlanta, Georgia. Al Hartmann | The Salt Lake Tribune "Meet the Mormons" writer and director Blair Treu. Al Hartmann | The Salt Lake Tribune "Meet the Mormons" writer and director Blair Treu. Al Hartmann | The Salt Lake Tribune "Meet the Mormons" cast member Bishnu Adhikari, left, listens as her daughter Smina describes her experiences as a Mormon teenager in Nepal. Bishnu received a degree in engineering and returned to his home in Nepal as a new Mormon. He lives his new faith while respecting his culture and family expecatations. Al Hartmann | The Salt Lake Tribune "Meet the Mormons" cast member Carolina Munoz Marin is a top women's amateur kickboxer in Costa Rica. She and her husband run a charity. 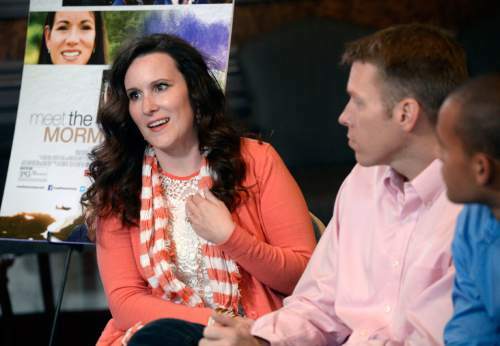 Al Hartmann | The Salt Lake Tribune "Meet the Mormons" cast member Dawn Armstrong, center was a struggling single mother when she met some Mormon missionaries. She has started a new life in Utah with her husband Craig, left, and son Anthony, right. Al Hartmann | The Salt Lake Tribune "Meet the Mormons" cast member Dawn Armstrong was a struggling single mother when she met some Mormon missionaries. She has started a new life in Utah with her husband Craig and son Anthony, right. Al Hartmann | The Salt Lake Tribune "Meet the Mormons" cast member Dawn Armstrong was a struggling single mother when she met some Mormon missionaries. She has started a new life in Utah with her husband Craig and son Anthony, right. Al Hartmann | The Salt Lake Tribune "Meet the Mormons" cast member Jermaine Sullivan. He is an academic counselor and volunteers as a bishop of a dieverse Mormon congregation in Atlanta, Georgia. Al Hartmann | The Salt Lake Tribune "Meet the Mormons" cast member Jermaine Sullivan. 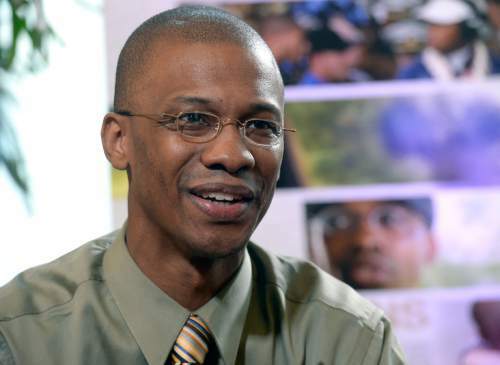 He is an academic counselor and volunteers as a bishop of a dieverse Mormon congregation in Atlanta, Georgia. Al Hartmann | The Salt Lake Tribune ìMeet the Mormonsî cast member Bishnu Adhikari, left, listens as her daughter Smina describes her experiences as a Mormon teenager in Nepal. 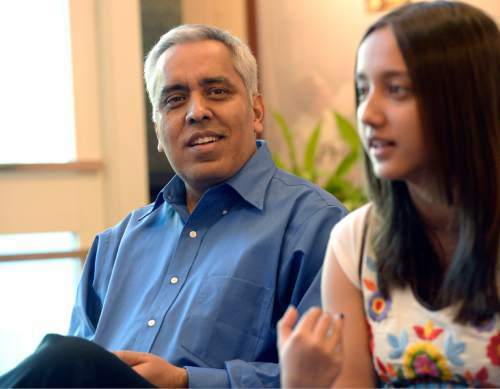 Bishnu received a degree in engineering and returned to his home in Nepal as a new Mormon. He lives his new faith while respecting his culture and family expecatations. Al Hartmann | The Salt Lake Tribune ìMeet the Mormonsî cast member Dawn Armstrong was a struggling single mother when she met some Mormon missionaries. 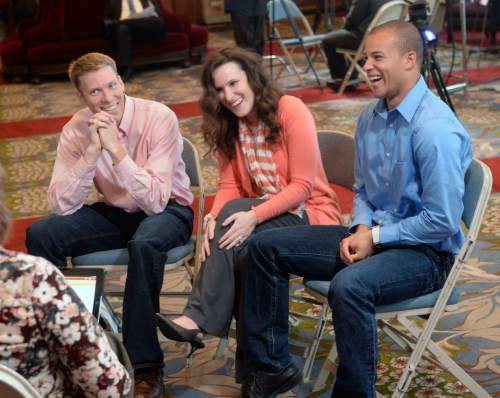 She has started a new life in Utah with her husband Craig, left, and son Anthony, right. Jermaine Sullivan attended Baptist, Pentecostal and other Christian churches, but couldn&apos;t find what he was looking for in any one faith. Then, in 1999, Sullivan saw a television spot for an LDS video. The young black man jumped up and called the number on the ad. Three days later, Mormon missionaries showed up to teach him the tenets of The Church of Jesus Christ of Latter-day Saints. Two weeks later, he was baptized. It was, Sullivan said, the story of Mormon founder Joseph Smith and his teenage quest for truth in 1820 that captured his imagination. Sullivan&apos;s conversion, though, has no place in the movie "Meet the Mormons," due in theaters Friday. And that&apos;s on purpose, filmmaker Blair Treu said Tuesday. "We chose not to use conversion stories," Treu said, "because we are not pushing conversion." The LDS Church wanted to send a message to all viewers, he said, that Mormons are not "different from you. We want to find common ground and build bridges of understanding." 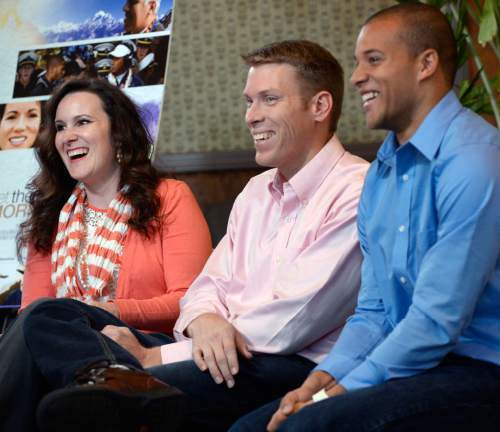 Instead of explaining doctrinal beliefs, the Utah-based faith wanted to highlight how the six featured Mormons  drawn from an ethnically diverse worldwide church  live their lives based on their religion. And Sullivan, for one, believes the film achieves that. "It reflects the reality of what the church looks like," he said. For instance, moviegoers will see Sullivan acting in his role as a Mormon bishop in Atlanta (though he now is a stake [regional] president), teaching young Latter-day Saints how to dance and greeting members in his urban congregation. They can follow Ken Niumatalolo, who coaches Navy&apos;s football team and also teaches a children&apos;s Sunday school class. Mormon mom Carolina Muñoz Marin is depicted working her way to the top of women&apos;s amateur kickboxing in Costa Rica, while nurturing her young family and helping her husband run a charity. And retold is Col. Gail Halvorsen&apos;s well-known tale of dropping candy to children during the 1940s Berlin Airlift. The film shows Dawn Armstrong, who found Mormonism through missionaries after she and her then-18-month-old son, Anthony, moved out of an Iowa homeless shelter. When Armstrong&apos;s second son, Tre, died at three months, the 18-year-old single mother made a huge change  moving to Utah. She now has six more living children with husband Craig Armstrong and Anthony (whom Craig Armstrong adopted) has just wrapped up a two-year Mormon mission to Durban, South Africa. The filmmakers were looking for a missionary story, one that featured a large family, a strong female presence and a foreign mission, Armstrong said. Their family fit all the categories. Finally, there is Bishnu Adhikari, a Nepalese humanitarian who joined the LDS Church after encountering a missionary in Russia. Adhikari felt the missionary was the embodiment of all that he wanted to be, the soft-spoken civil engineer said Tuesday. "He was perfection in the way he dressed, the words he chose, the life he led. I wondered what was influencing him. It was his faith, which was based in the Book of Mormon." After reading the LDS scripture, Adhikari said, "many things began making sense." 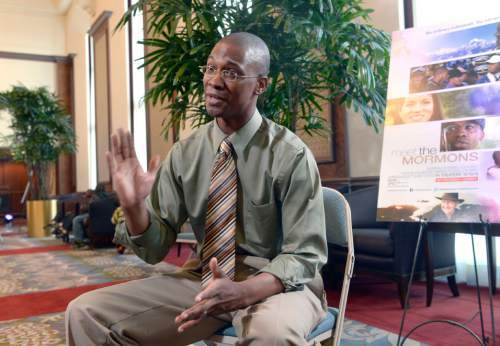 The self-effacing convert wants no attention for himself from "Meet the Mormons," but if someone around the world sees the film "and follows the truth I built my life upon," he said, then he will feel his involvement was "a success." 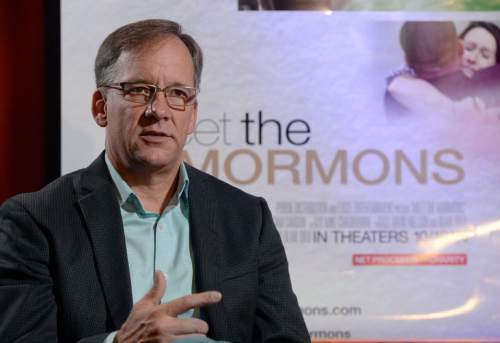 Tribune film critic Sean P. Means reviews "Meet the Mormons." • C7.